NatureMill PRO Indoor Composter | OhGizmo! Composting is an easy way to deal with certain types of waste, as long as you have somewhere to set up a compost pile. If you live in an apartment like me, just leaving a pile of garbage to rot in the corner is apparently frowned upon by your stuck-up neighbors who won’t mind their own business. 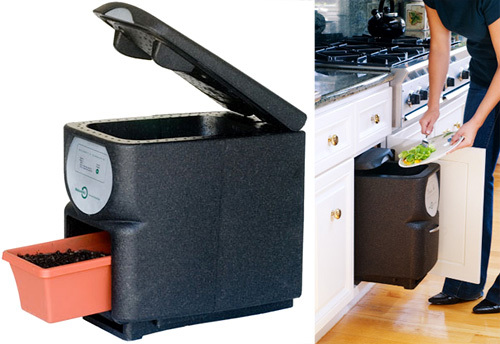 So if your neighbors have filed similar complaints, you might want to try the NatureMill PRO which looks like a trashcan, but works like a composter. It can accept up to 120 lbs of food waste per month, and roughly every 2 weeks there’s a fresh supply of compost you can use for a window garden, or whatever else the stuff is used for. Of course the biggest concern of having an indoor composting machine is the smell, but apparently the cultures used in the NatureMill PRO only produce a mild aroma similar to mushrooms. And I assume it’s only noticeable when the lid is open, or when you remove the compost tray. The NatureMill PRO is available for $399 but there’s also a slightly cheaper PLUS version for $299. And for pet owners there’s even a Pet-friendly version for $399 that’s specially tuned to deal with the waste products they produce. It gave me $20 off.